Following the discontinuation in the UK of the only single active praziquantel product for equine tapeworm treatment, BAVP member Prof. Jacqui Matthews from the Moredun Research Institute has teamed up with Westgate Labs and Equisal to produce a guide on best practice for strategic equine endoparasite control. See Equisal’s press release for more details. The guide includes reccommended treatment choices based on positive worm egg count and/or tapeworm tests at different times of the year, and a table showing the current anthelmintic resistance status of equine endoparasites. The Sustainable Control of Parasites in Sheep (SCOPS) and Control of Cattle Parasites Sustainably (COWS) groups are urging sheep and cattle farmers not to take their eyes off the ball when it comes to the liver fluke threat risk this autumn. While liver fluke burdens on pasture are expected to be much lower than last season, experts are warning it is dangerous to assume that applies to all farms, all areas on a farm, or that levels will remain low as the autumn progresses. Don’t get caught out by treating too early. Monitor to determine the need and timing of treatments (see list of tools below). In lower risk situations, consider treating sheep with closantel or nitroxynil rather than triclabendazole. Worms (including haemonchus, which can produce signs similar to liver fluke disease) may be the problem, particularly in lambs. Keep in mind that haemonchus is also a risk for ewes. Investigate losses. A post mortem is still the best way to establish whether liver fluke is present. Monitor abattoir returns carefully for evidence of liver fluke. Faecal egg count (FEC) testing. To indicate if adult fluke are present in the animal. Coproantigen testing. Thought to detect the presence of fluke a little earlier (2-3 weeks in sheep) than a fluke FEC test. Blood (ELISA) testing. Detects antibodies produced when sheep and cattle are exposed to infections. These tests are most useful in animals in their first grazing season to indicate exposure to infection, but could be useful this year on farms where no exposure to fluke has been assumed because of the dry weather. Bulk-tank milk (ELISA) testing. To detect exposure to infection in dairy herds. Post mortems on dead animals. Abattoir returns on livers. A very useful source of information for both cattle and sheep. Lesley Stubbings, SCOPS: “When we get a dry year, it is even more important that each farm does its own risk assessment and carries out monitoring and testing to avoid getting caught out, because there will be huge variation between regions and farms”. 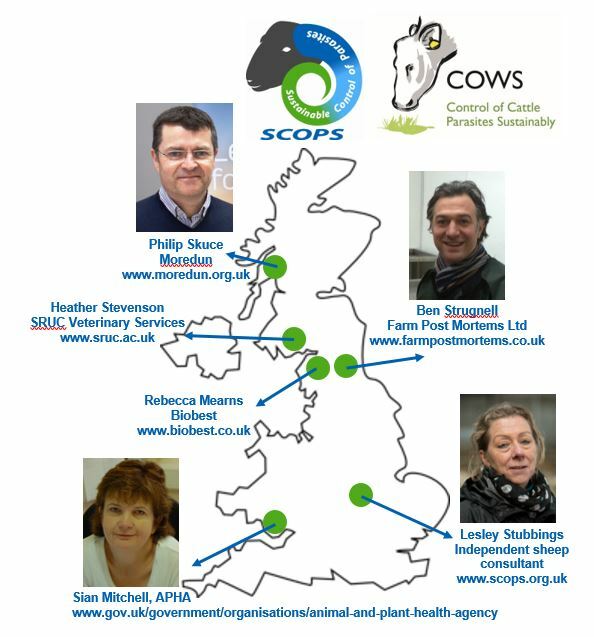 This press release is issued by National Sheep Association (NSA) on behalf of SCOPS. For more information contact Katie James, NSA Communications Officer, on 01684 892661 or katie@nationalsheep.org.uk. Abstract submission for the BAVP winter meeting 2018 has now been extended to Friday 30th November. If you are interested in submitting an abstract or attending please see our event poster for more details on registration fees, abstract submissions etc. This year’s BAVP winter meeting will be held on the 10th – 11th December at the University of Cambridge. If you are interested in attending as either a delegate or as a presenter you can download a registration form by clicking here. Please complete this and return as instructed on the form. 2 Positions available at the Moredun Research Institute, working on the Soay sheep project (http://soaysheep.biology.ed.ac.uk/) on a new NERC funded project, with a great collaborative team. The Research Fellow will be an innovative, highly productive, ambitious and collaborative member of a new research group led by Professor Eric Morgan in the School of Biological Sciences. The position will involve working as part of a research programme that is investigating the epidemiology of parasite infections in animals under climate change. The purpose of the project is primarily to adapt, develop further and validate existing epidemiological simulation models to consider the impact of targeted selective treatment (TST) of gastrointestinal nematodes in cattle, on both parasite population dynamics and herd performance. These models will be used to inform TST trials on selected farms in Northern Ireland, to provide proof of principle and underpin wider uptake. A parallel work programme will refine empirical understanding of climatic drivers of infective nematode larval availability and distribution, to feed into model structure and parameter estimation. Simulations using the model will assess the sustainability of TST approaches under climate and farm management change. Outputs will be high quality peer reviewed publications, strategic recommendations to the UK cattle farming industry and a toolkit for computer simulation of parasites on cattle farms. The successful Research Fellow will lead this ambitious cutting edge research project and will be involved in supervision, planning, day-to-day lab management, collaborations (including with project partners at Newcastle University) and outreach. This is a 30-month post funded by the UK Biotechnology and Biological Sciences Research Council, ending on 31 April 2021.